"Pyramid" is the definition of a completely luck-fuelled guessing game. 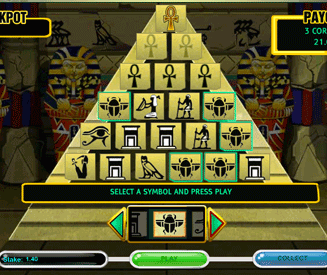 The aim of the Pyramid game is to climb your way to the top of the Pyramid by selecting matching Egyptian symbols on each row. Each tablet on every row has a symbol on it and you have to hope that at least one of them matches your chosen symbol. As you progress through the game, the number of tablets on each row decreases, meaning that you’re going to need to get even luckier to win more money. Note: Pyramid for some reason reminds me of the Guess Who? board game. Minus the hilarious faces, interactivity and fun. Basically all the good bits then. If you’re a pro in the art of guessing and have a degree in "getting lucky", Pyramid will be a worthy opponent. On the other hand, if you prefer to make calculated wagers or use your noggin just that little bit, Pyramid will leave you disappointed. My fun rating - 56%. Do you enjoy getting lucky? Of course you do, but would you want a play a game where your only option is to get lucky? Sure, most (if not all) games for real money involve an element of luck, but at least in the majority of games you get to play according to how lucky you feel. For example, in Hi Lo Gambler you might choose higher on a Jack if you’re feeling fruity. If not, you’ll choose lower. In Pyramid on the other hand, you don’t get to tailor your odds. There are no conservative or aggressive strategies. The only strategy you have available to you is to cross your fingers twice as hard as normal. The Pyramid game has a very high maximum payout if you end up getting obscenely lucky, but it’s nowhere near enough to compensate for what is otherwise a very bland, fixed-odds effort. Select a your stake and a symbol. Click "Play" and hope that your chosen symbol appears on one of the tablets as they turn around. Choose to either gamble your current winnings for a bigger win on the next row with fewer tablets, or collect them and start again. The basic aim of the game is to climb as far up the Pyramid as you can. However, it’s entirely up to you if you want to risk your earnings from one row to the next. 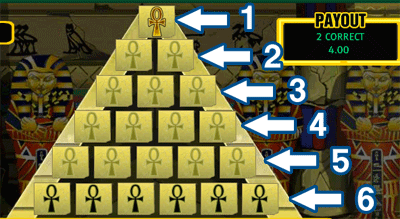 There are 8 different symbols in the game of Pyramid. The are 6 levels/rows on the pyramid, each containing fewer tablets as you move up the Pyramid (starting with 6 tablets on the first row). Each row of the Pyramid is like it’s own separate round in the game. At the start of each round you have to choose 1 symbol out of the 8 available to you. When you click "Play", you simply hope that there is at least one matching symbol to your chosen symbol on that row. If there are one or more matching symbols, you win money and progress to the next round. If there are no matching symbols, you lose your winnings and the game is over. Fact: No one symbol is more likely to appear than another. They each have equal odds of showing up. The further you move up the Pyramid the bigger the payouts will be (generally). This is because there will be 1 less tablet on each row as you move up, which in turn means that there is less chance that you will find a matching symbol. You can collect your winnings at any time in the game. Here are all 8 symbols to choose from in the game of Pyramid. The bug is my personal favourite weapon of choice. The row/round you are on in the game. The number of matching symbols you achieve in that round. Funnily enough, the first round actually has the biggest potential payout. This is because achieving 6 matching symbols on 6 different tablets is the most unlikely outcome. The max multipliers decrease as you move up the pyramid due to the fewer numbers of tablets. Note: It’s a bit like lottery. Matching all 6 numbers out of 6 in the National Lottery will net you millions. Whereas matching 3 numbers out of 3 down the pub or in work will have a much lower payout. Winnings are rolled over from one round to the next. Therefore, if you win £10 in the first round, that £10 will be taken over on to the second row to be gambled (if you wish to do so). The progressive Jackpot in Pyramid is released if you manage to make it through all 6 rounds and correctly guess the final tile at the top of the Pyramid. Therefore, in addition to winning 8x your accumulated stake, you will also win the current size of the Pyramid game progressive jackpot at the time of play. The progressive jackpot amount varies depending on how long it has been since it was last released and how many times the game has been played in that time.